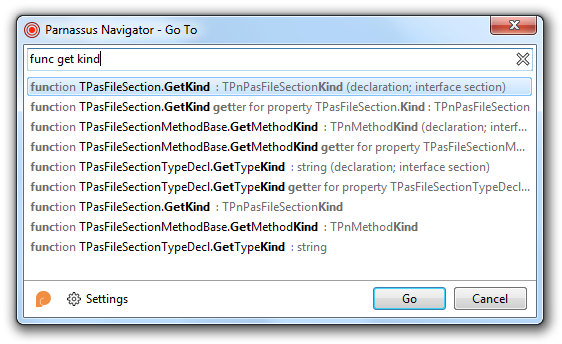 Parnassus Bookmarks replaces the IDE’s inbuilt functionality with new, improved navigation. Place a marker with Ctrl+B – a number will be automatically assigned. Jump between bookmarks by pressing Ctrl+Alt+Left or Right Arrow. Never overwrite an existing bookmark accidentally. And the polished interface – suitable for a modern IDE – features elegant visual cues when you create, delete, or access a bookmark as well as succinct information about where in a unit the bookmark is. You can use Parnassus Bookmarks just like the inbuilt bookmarks if you want, and the plugin adds all the expected stuff, such as an unlimited number of markers per file. (You might not use a thousand, but more than ten can be useful.) But the key is that it’s been designed for coders, with keyboard shortcuts, new features, and readability put first. When you debug, you travel over a lot of code – across methods, classes, units, and sometimes even projects. Parnassus Bookmarks shows you all bookmarks you’ve dropped in all open files, as well as just in the current file, if you wish. It makes marking – and finding – key code much, much easier. The docked window shows you intelligent information about where each bookmark is: not just the unit and line number, but the essential data about its location. If it’s in a procedure or function, you’ll see the method name. If it’s in a class, record or other type declaration, you can see which one. Sometimes you don’t want a permanent marker; you just want a way to quickly navigate back to where you were. Press Ctrl+Shift+B to drop a temporary caret bookmark, and press Escape to jump back to it. If you leave several, each time you press Escape you will go back in time to where you were at that moment. You can even repeatedly toggle between two locations with Shift-Escape. Parnassus Bookmarks is written in modern Delphi style, with modern libraries, and supports modern IDEs. It is explicitly written to have high performance, avoiding common plugin techniques that can slow down the IDE, and it integrates perfectly with the IDE itself – better than the IDE’s own bookmarks implementation does. Even its icons should be easier to read. There’s even a public API, allowing third-party (non-Parnassus) Delphi plugins to interoperate with Bookmarks. Finally, it addresses or fixes eight different bookmark-related QC items. Make your IDE better.